Hours after snowfall warnings were issued for parts of north-central Alberta, the snow started falling. 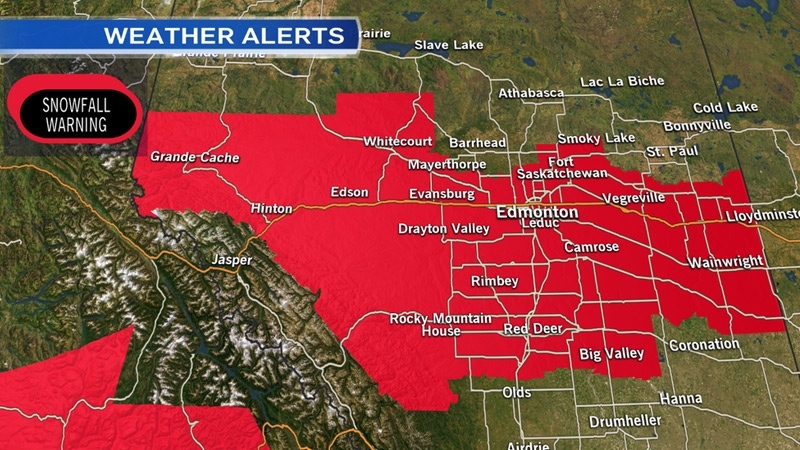 Throughout the morning Monday, snowfall warnings were issued for Edmonton and area, as far west as Hinton-Grande Cache, and as far east as Lloydminster-Wainwright-Vermilion-Provost. 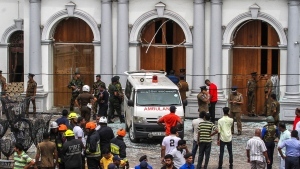 The warnings stated a long period of snowfall was expected with between 10 and 20 cm expected to fall. By the early afternoon, snow had started falling in the Edmonton-area, covering streets and many of the surrounding highways with snow and ice. In Edmonton, 133 sanders were sent out by City officials – and officials were warning drivers to take care on roads, to ensure the safety of themselves, and other drivers, but also for the safety of the crews doing the work. “Remember they are serving the public and trying to make our roads safer, serving our residents, trying to do a good job so our roads are as safe as possible,” Eduardo Sosa with the City of Edmonton said. Officials said snow plows are dispatched once about three centimetres of snow has accumulated – and officials said contractors will be brought in if necessary. Edmonton police and RCMP in the surrounding areas were advising drivers to use caution when driving in the snowy conditions. RCMP said at about 3:20 p.m., officers were on the scene of eight separate crashes on the QEII highway between Ponoka and Didsbury – at least one of those collisions resulted in serious injuries. CTV Edmonton Meteorologist Josh Classen said icy roads and blowing snow will be a problem, especially on area highways – and those driving conditions would likely continue into the night, and winds should ease by Tuesday. Classen said the warning for Edmonton and surrounding areas will likely remain until Tuesday morning. Plus, the snow is expected to keep falling overnight; tapering off in the Capital Region by midday Tuesday – at that point, between 10 and 20 cm of snow is possible. There will be a reprieve from the wintery blast, Classen said cooler weather will stay for a day or two, but it should be sunny and temperatures should rise again by the end of the week. 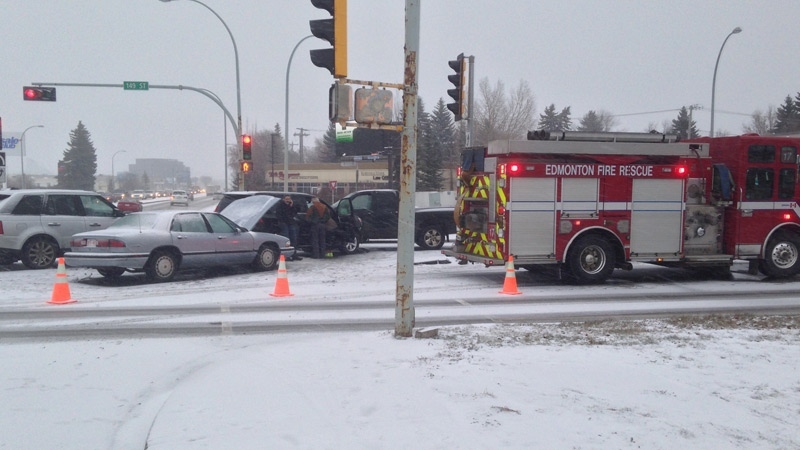 Emergency crews on the scene of a multiple vehicle collision on the intersection of 111 Ave. and 149 St. on Monday, November 23, 2015. Snowfall warnings issued for parts of north-central Alberta for Monday, November 23, 2015.